This was one of my favorite international trips ever. This time I was traveling to visit my brother and his fiancé. Levi has been living in Italy for a few years now and I have not seen where he lives or what his life is since he was still in Seattle. This trip was extra special as he got engaged in January and I got to meet her whole family. After a ridiculous travel day and a half that included 7 hours at the Paris airport and a bag that didn’t make it to Florence I was greeted by Alix’s welcoming family. They live in a small village about 45 minutes outside Florence. Her mom made a wonderful dinner and I was somehow awake after sleeping on and off all day in Paris. Since I arrived in the dark I didn’t get to see how beautiful the house and setting was. When I woke up the next day at who knows what time, Levi brought me a cappuccino in bed. What a great brother. Levi and Alix got a new car, a Panda. I started off my first whole day by going with Levi and Alix to visit a possible wedding location. This is not something I ever imagined doing with my brother. 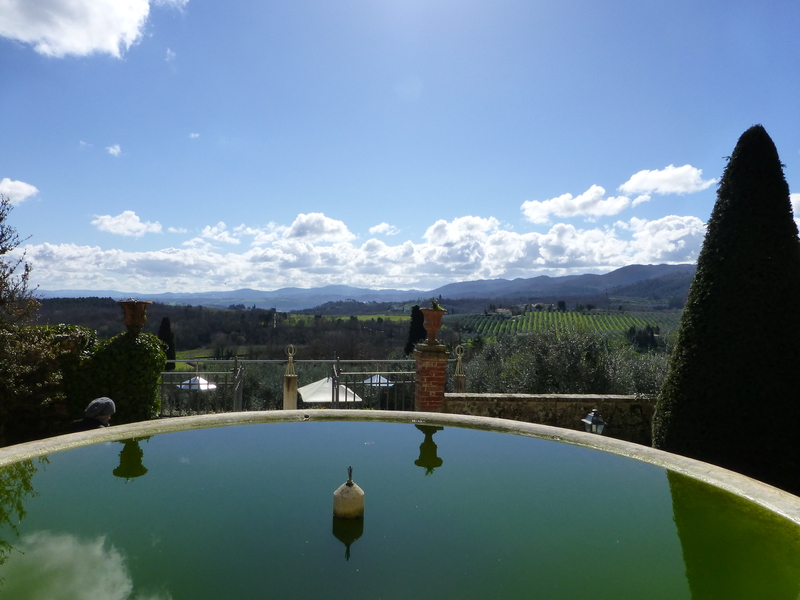 And to be doing it in Tuscany is just amazing. I need to say once more how much I love the girl he has chosen to spend his life with. Alix is wonderful and I’m so happy for them. I hate that we live so far apart, but that just means I have to go back to Italy. Levi took the week off so we got to explore together. He took me around Chianti in the rain, which was still pretty. He took me to Siena where we had pasta and wine and gelato. We spent a day in Florence where I got to meet one of his coworkers. It was wonderful. I haven’t spent this much time with Levi in years. It’s always so rushed and full of other people. I spent my days with Levi eating delicious Italian food and drinking wine at lunch. In the evenings we met up with Alix and her family. So much good food. And quite nice weather compared to what I left at home. After a fun week in Tuscany Levi, Alix, her brother David, and I took the train to Rome. Their other brother lives in Rome and both Alix and David lived there in the past. Rome is a great city and it was so fun to be there with people who knew the city. We played tourist some and met up with friends of theirs. I saw the Pantheon and the Coliseum. Rome was a wonderfully walkable city. I most definitely want to go back. I know I will be back in Italy next April for the wedding and my goal is to speak Italian by then. I find I can sometimes understand what is being said, but find it horribly frustrating that I can’t speak a word. I would love to get back sooner, but the airlines want money, and lots of it, for travel to Italy. So arrivederci Italy, I look forward to next time. A huge thank you to Levi, an amazing brother, to Alix, who I can’t wait to have as a sister, and to her whole family for welcoming me so generously. What an amazing trip! I’m so glad you got to spend time with your brother. Your photos are absolutely stunning! I really enjoyed reading this – thank you so much for sharing! Ah, I’m glad you enjoyed reading. I only cried like three times while writing it and going through the photos. I’m such a sap.